Tables are of course a mainstay of every household, one in the kitchen, one in the dining room, one for coffee, the ends of the couch, and anywhere else you may want to place objects at a more convenient height than on the floor. 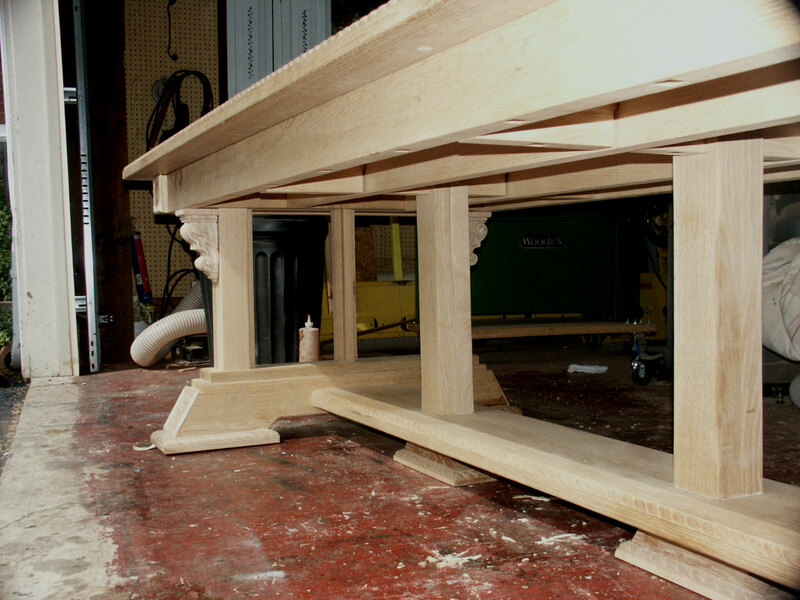 The function of keeping things 30" or so off the floor is simple enough, its when form and artistic presentation come into play that things get interesting. 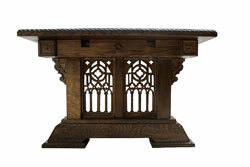 Artisans has created a unique class of furniture we call New Wave Gothic Furniture. 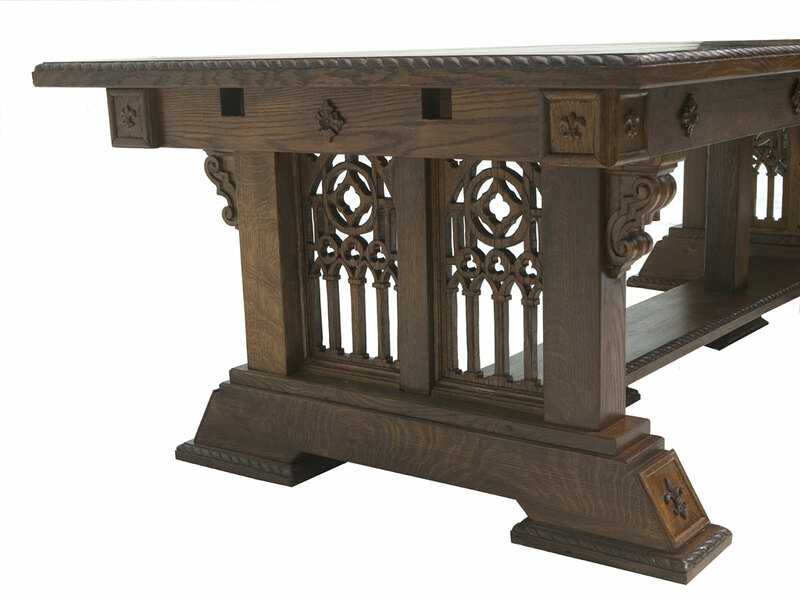 Gothic, Tudor, Elizabethan, Jacobean, Renaissance, and even Mission, Country, and Pilgrim Century influences are all featured in our "New Wave Gothic" line. 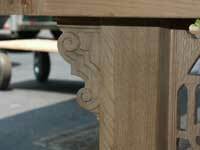 This style is providing a blend of solid but not overly massive structures. 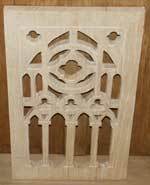 Artisans new designs are perfect for second Gothic Revival; traditional period features intertwined with modern function and characteristics. 2005 brought on this portfolio class table - This New Wave Gothic style piece, designed in partnership with our client is the second piece of Artisans "New Wave Gothic" line. 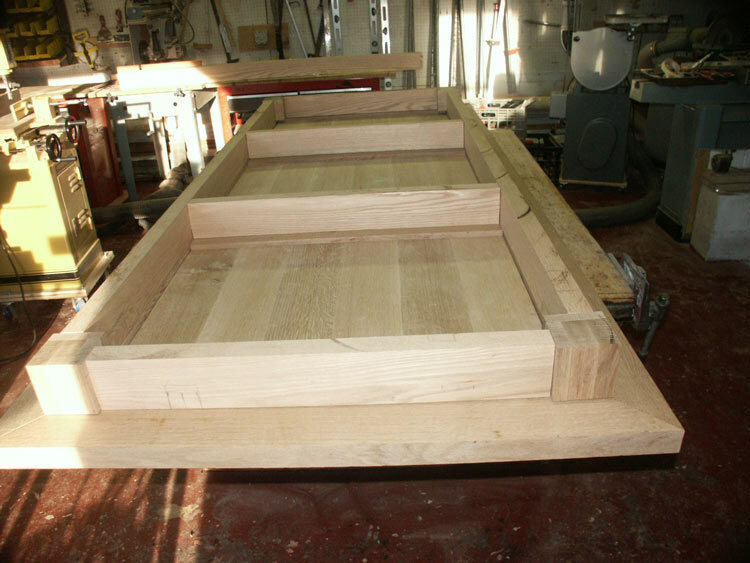 This piece is quarter sawn white oak measuring 100" in length 44" wide, and 30" surface height with a 12" leaf on each end. 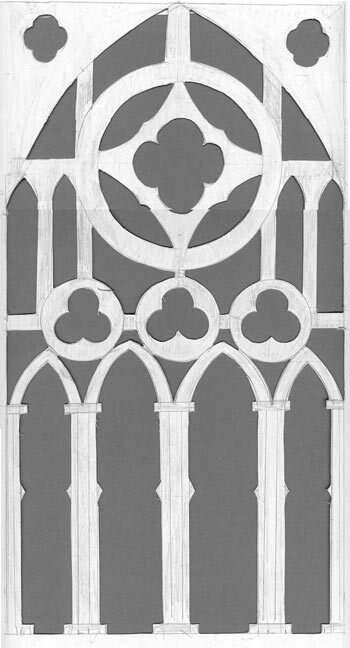 The primary features is four gothic tracery piercing, pattern shown below right; the piercing modeled after Renaissance church windows will be setup as panels between the legs. 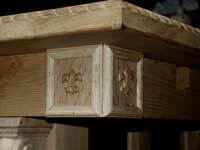 In addition, rope carvings around the horizontal surfaces, a variety of appliques and four feature corbels will adorn the piece. Hand carving is a key feature on all our custom pieces. 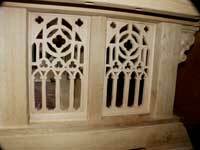 The design centered around the concept of the fretwork in the base of the table. Everything started here - we developed the plan and the scale of the piece against these four parts. The pattern template for the panels (shown left) was a collaboration between Artisans and our clients, whom both happened to be either math or physics majors. 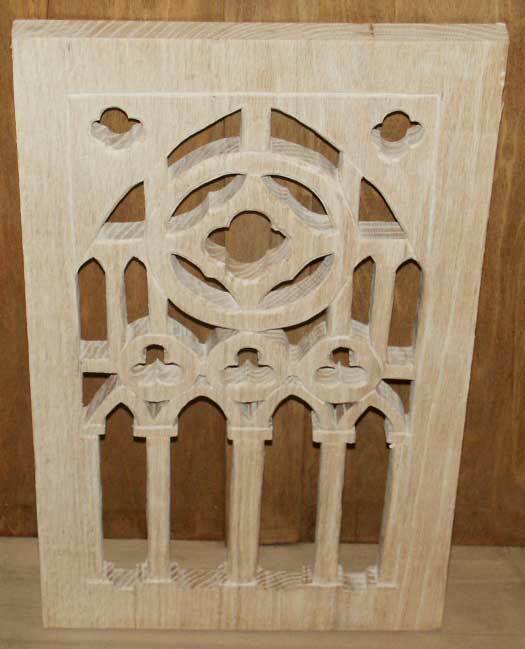 Stanley Saperstein, who created the initial design concepts for the table, taught them the basics of Gothic tracery, and this church window like design was born. 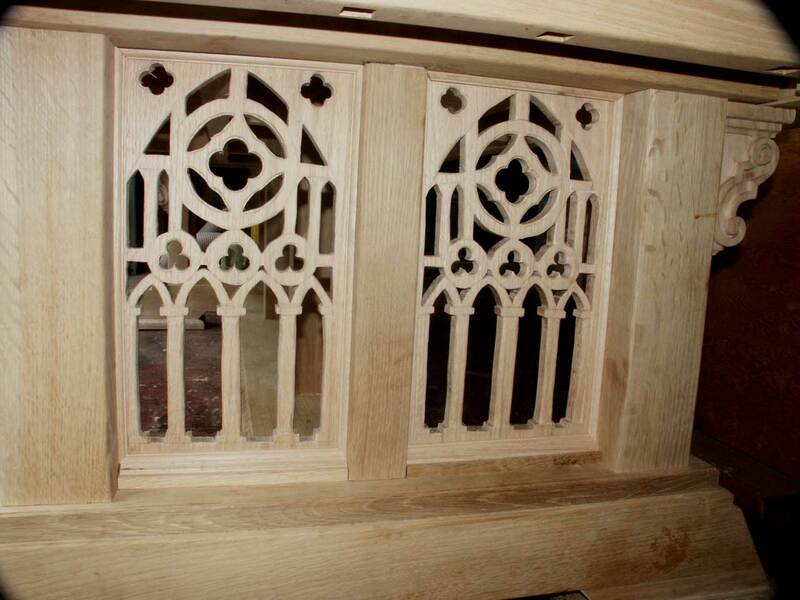 Fretwork is always a challenge, it has to be completed slowly and meticulously to avoid breaking it or making a false cut - otherwise its time to start over! 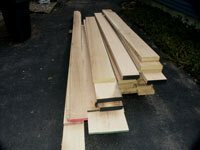 The construction phase begins in the usual way - the delivery of a pile of wood (shown below left). 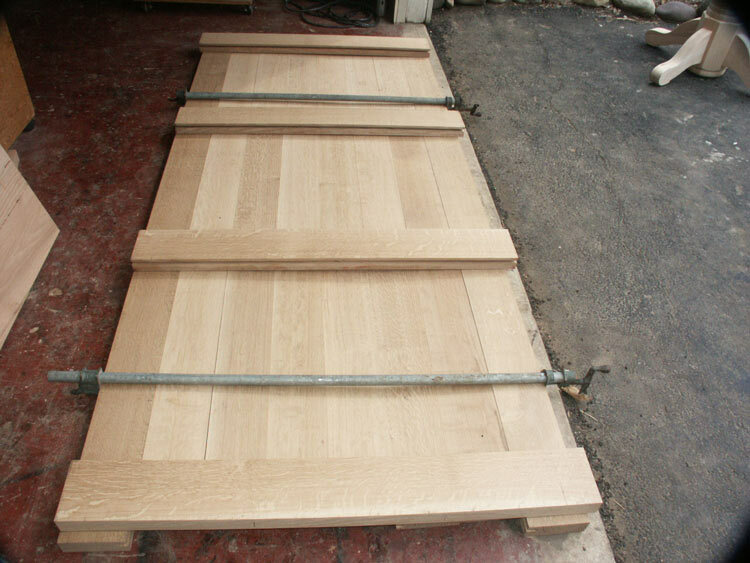 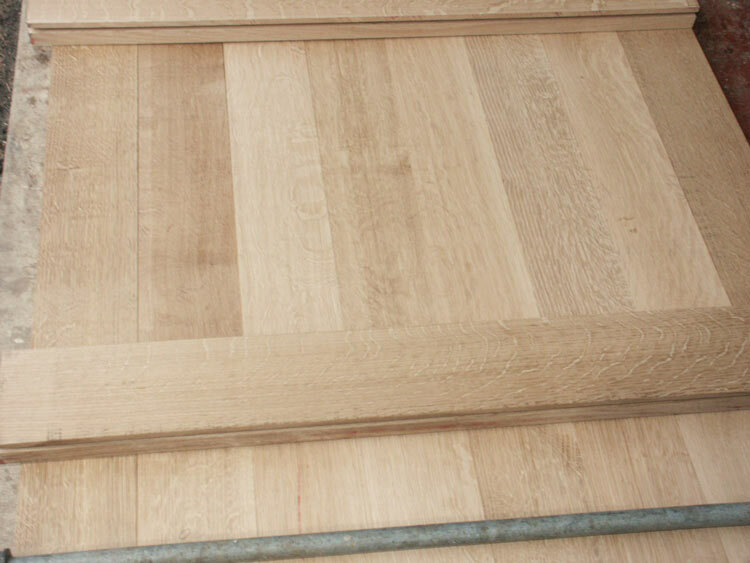 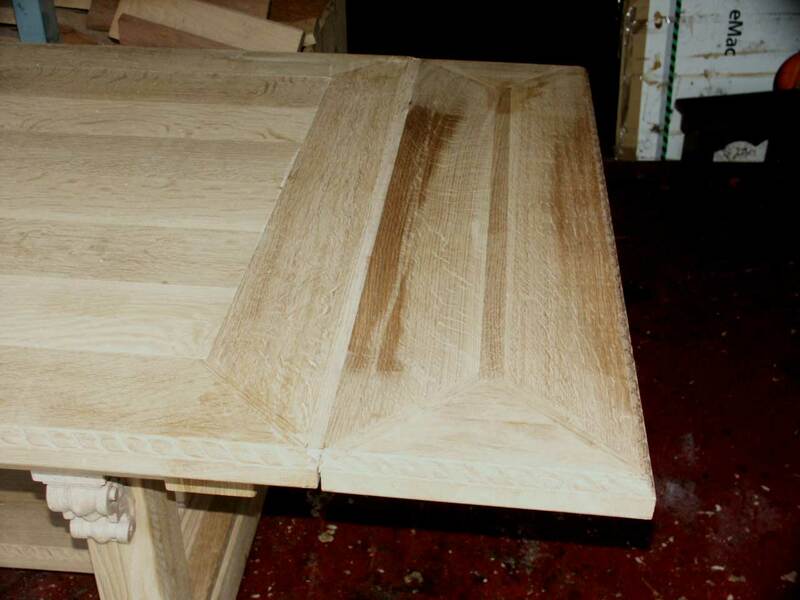 This is hand picked quartersawn white oak ranging from 4/4" to 8/4" in thickness, planks all picked to get the best use of the widths and specific plank requirements. 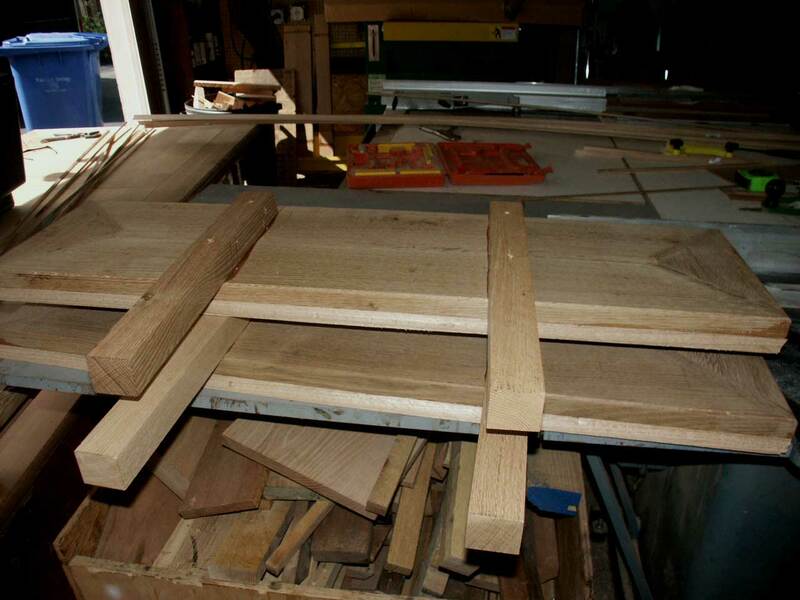 The first day was planing the lumber to clean up the surfaces and select the best planks for the top, ripping the tabletop planks to width, and laying out for the top three panel configuration and the framework that will support it. 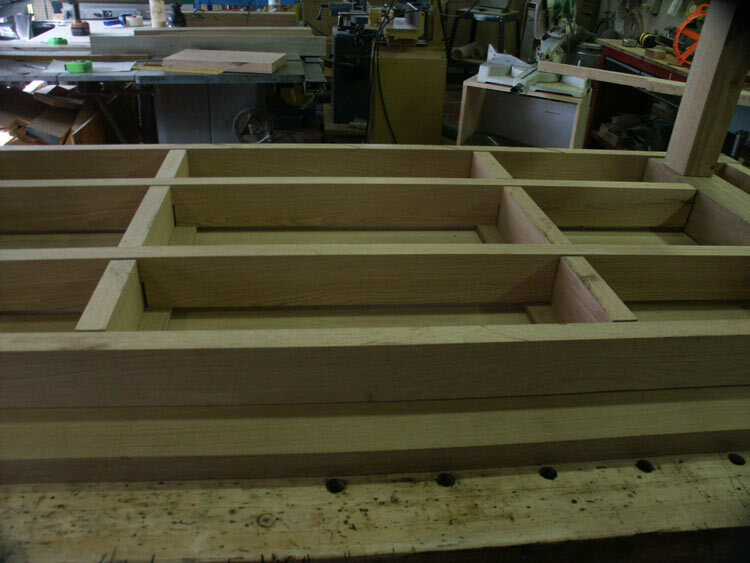 Once the tung and groves are cut and the frame and surface planks are to size, the next step was to miter the corners and setup the joint work for the tabletop frame. 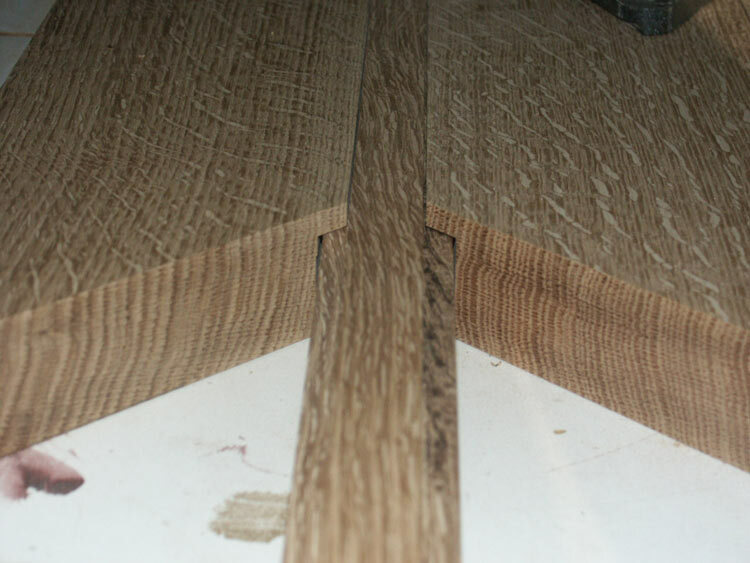 We employed splines to secure the miter joints and create a complete corner without the interruption of changes in grain pattern. 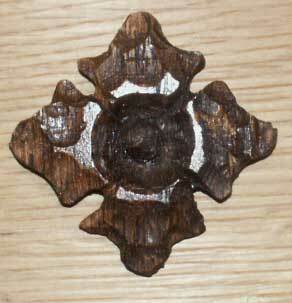 This is done to fa ciliate the rope carving around the top later. 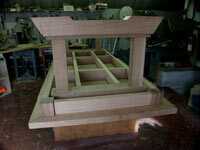 Once the corners were mitered and the splits cut and fit, the top immediately jumped into its form. Following the main surface - we cut the two end leaves. 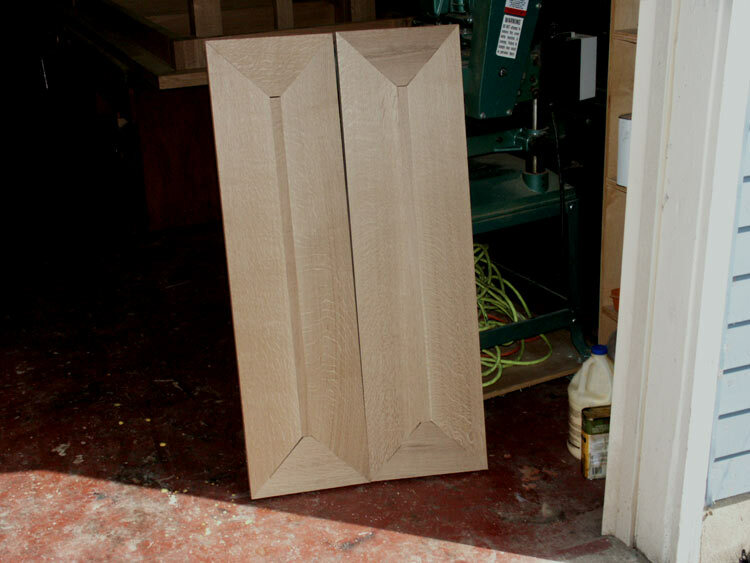 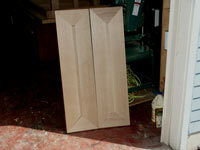 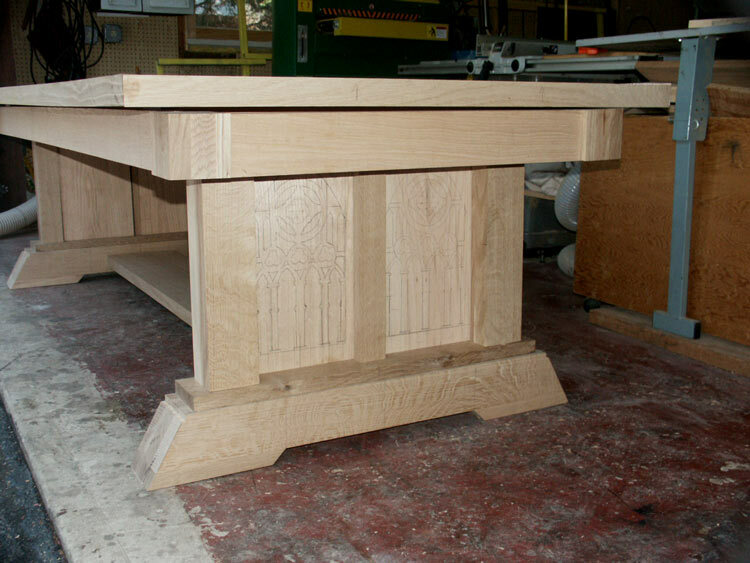 Simple mitered and jointed sections were created to add an extra two feet to the table when desired. 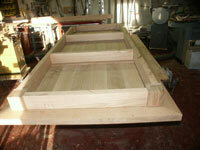 Once the dry-fit is done - the glue enters the picture. 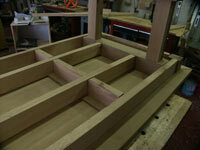 The tabletop is now fit and all structural surfaces in the joints are injected with adhesive. 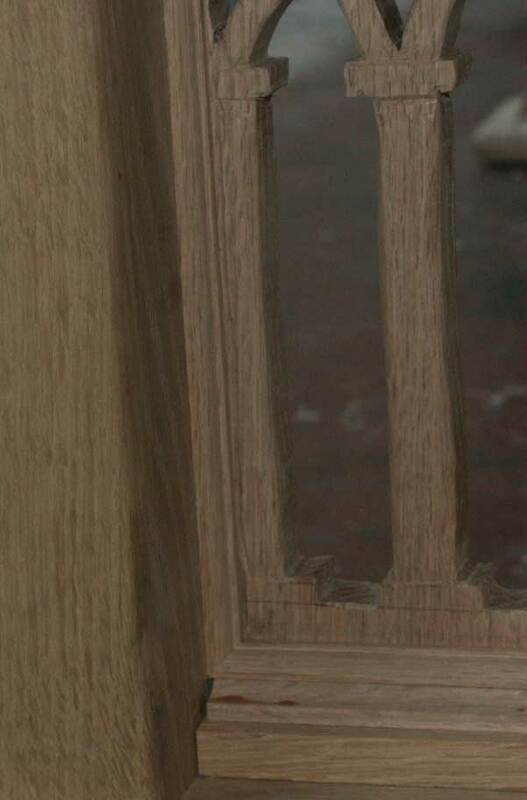 The panels in the surface, however, remain without any adhesive. 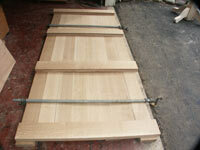 Panels float free, able to expand and contract with environmental changes. 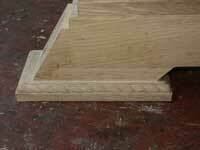 This ability greatly reduces the risk of a crack, check, or warp. 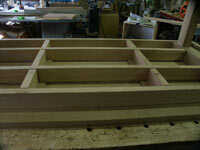 Solid wood has to breath, and this floating configuration allows it to do so. 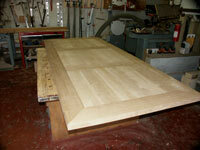 Following the tabletop comes the apron, generally we work our way down from the top - in an upside down format. 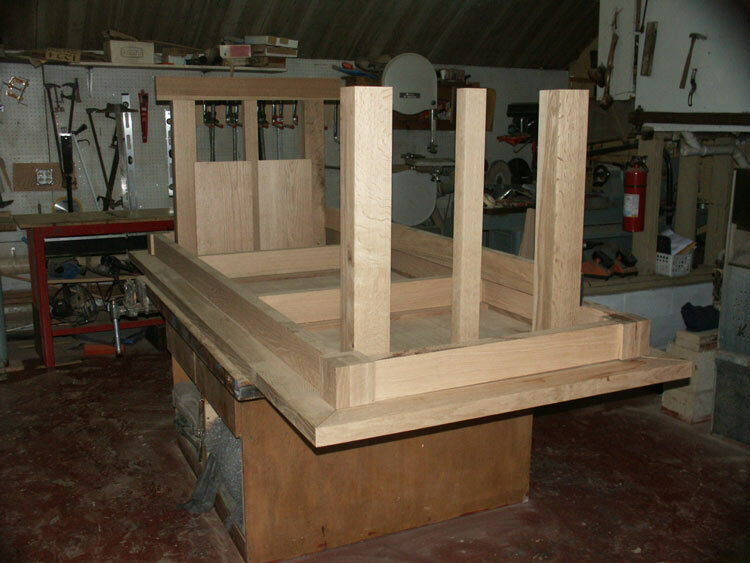 The top is flipped with the surface facing down, and the apron is fit around the frame. 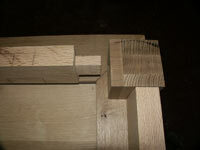 Next the leg sections are glued up, as well as the legs themselves. 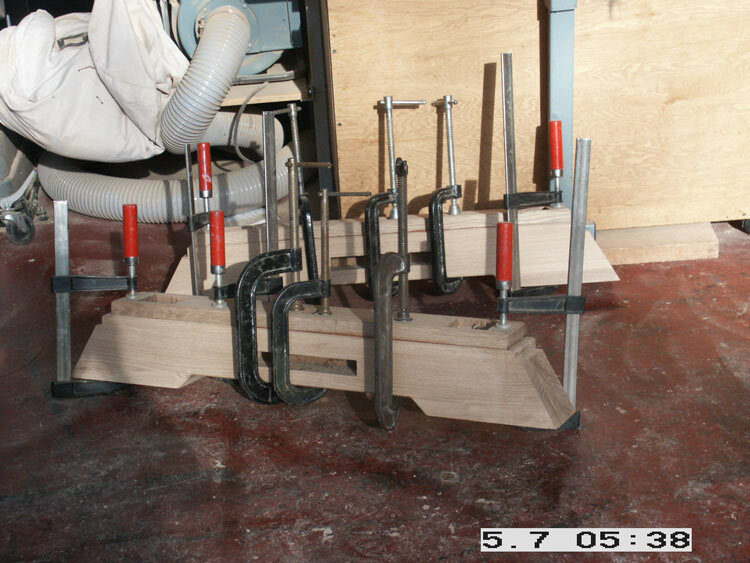 Just about every clamp in the shop was employed during this phase! Laminating a series of 8/4" sections into the final thickness creates a stronger and more stable configuration. 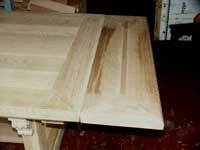 Using one large block of wood can often result in cracks and checks. 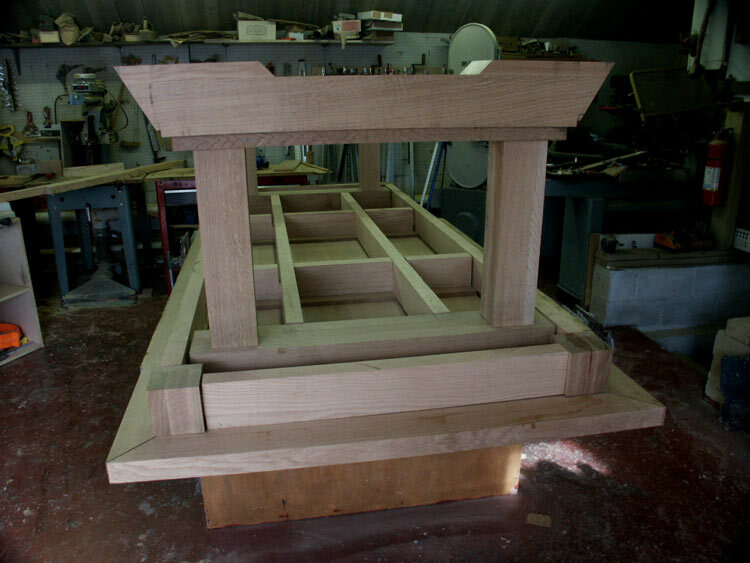 It was finally time for the table to begin to support itself - and at this stage - even without any adhesive or pegs in the base the piece stood up to not only its own weight, but would support a great deal more. 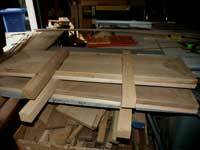 Just for fun we put about 2000lbs of shelving (still in the boxes) on the base just to see what it would do. 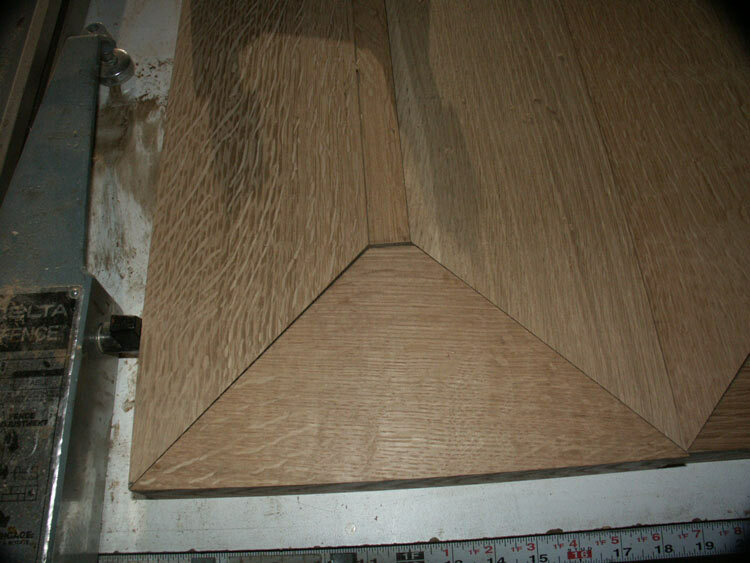 As we figured, white oak and a table this scale - didn't even notice. We're pretty confident that this table will support a car. Even with our confidence - we decided to add in two additional supports. 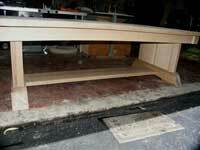 The space under the table was just too open, and we employed two center legs to break it up. 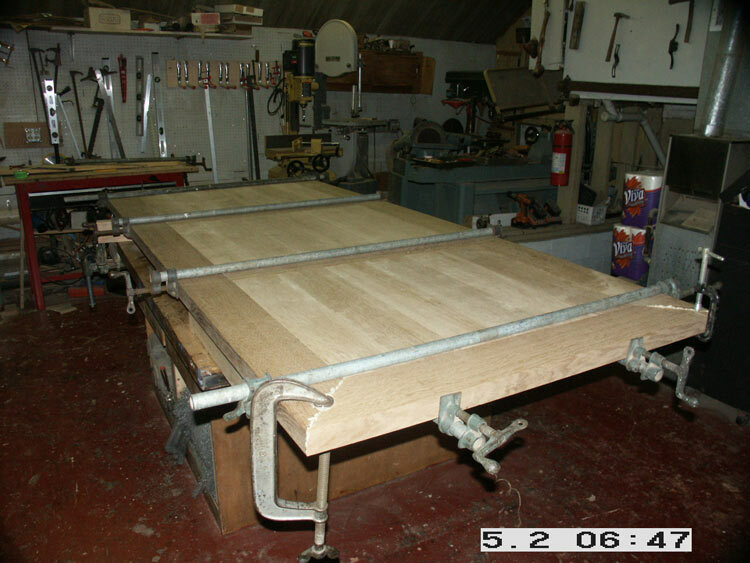 At this point, there's no doubt the table will happily support a truck. 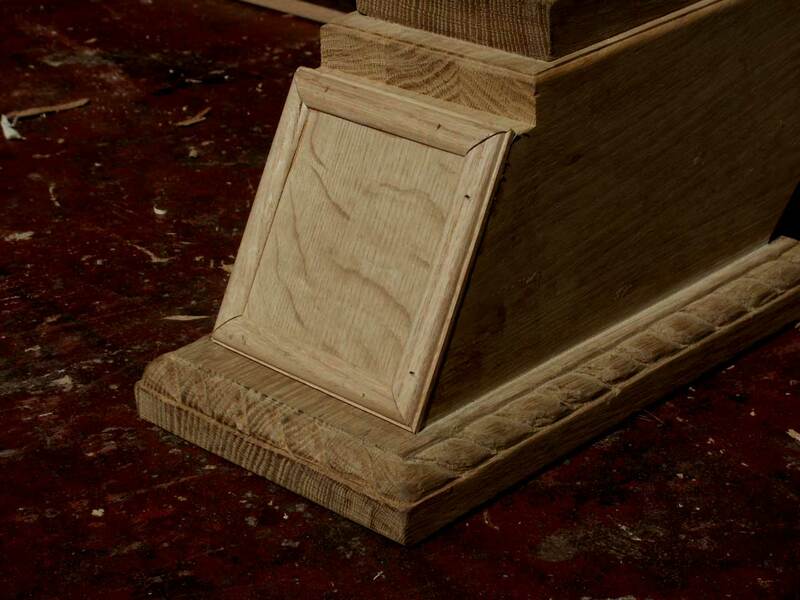 The feet bases were rope carved before they were fit, as it would be impossible to do so with the obstruction of the rest of the foot and legs. 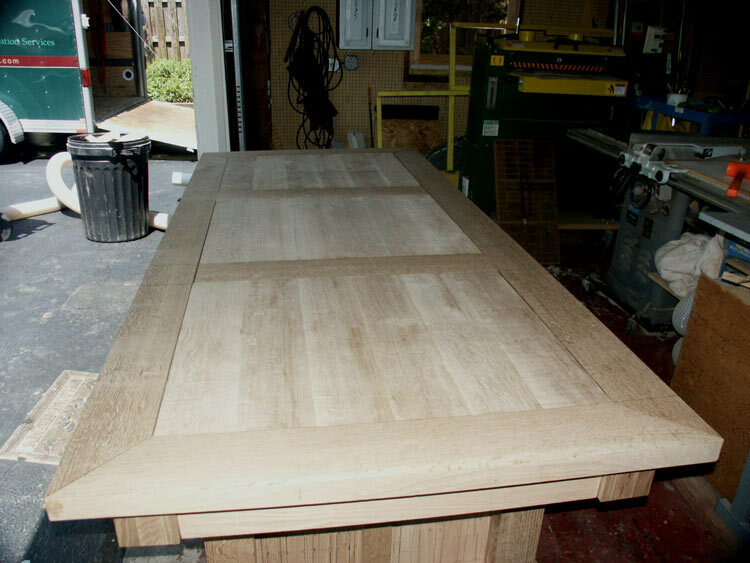 Now, Gothic aside - power assistance is not out of the question, but since we couldn't find a sander or planer big enough to hold this tabletop we thought we may have to turn back to hand planes after all. 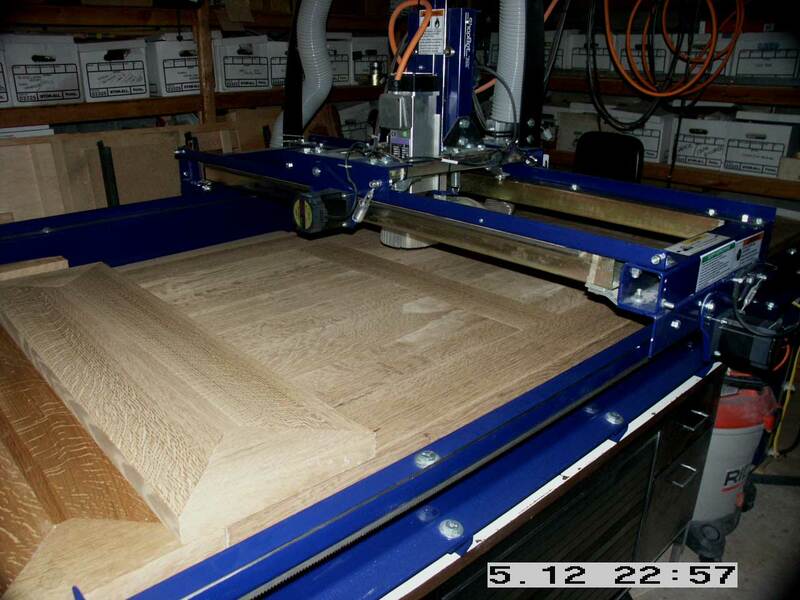 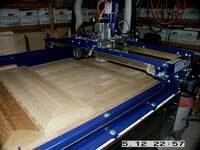 Then the realization came upon us - why not put it on on a CNC table and surface it using the router. 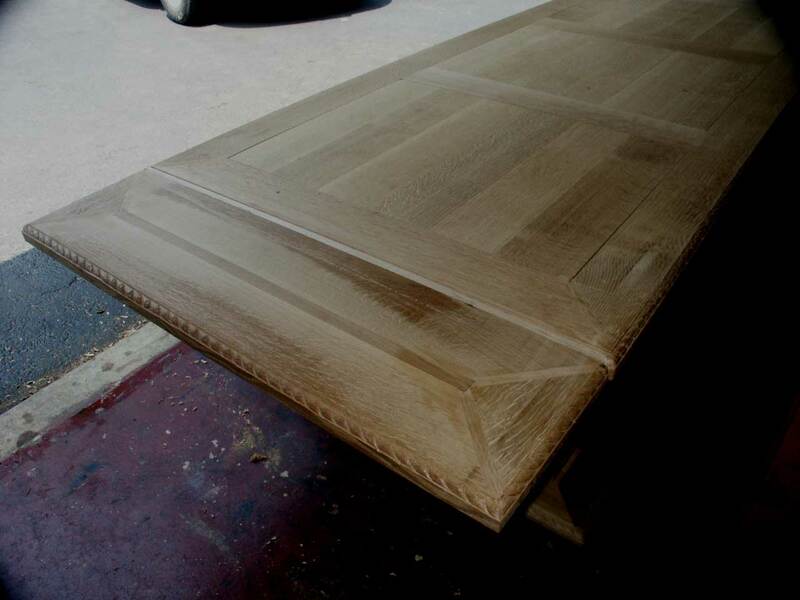 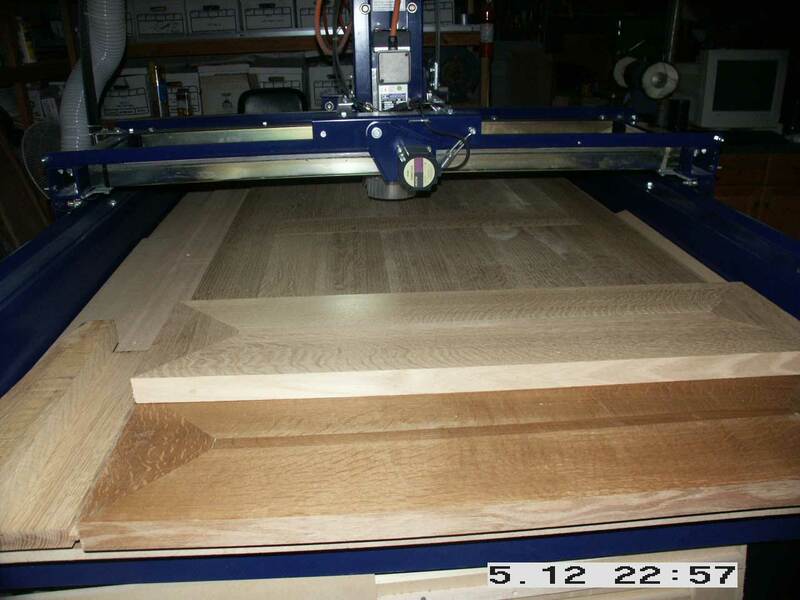 The process worked perfectly and the tabletop was returned to us with a perfect surface. 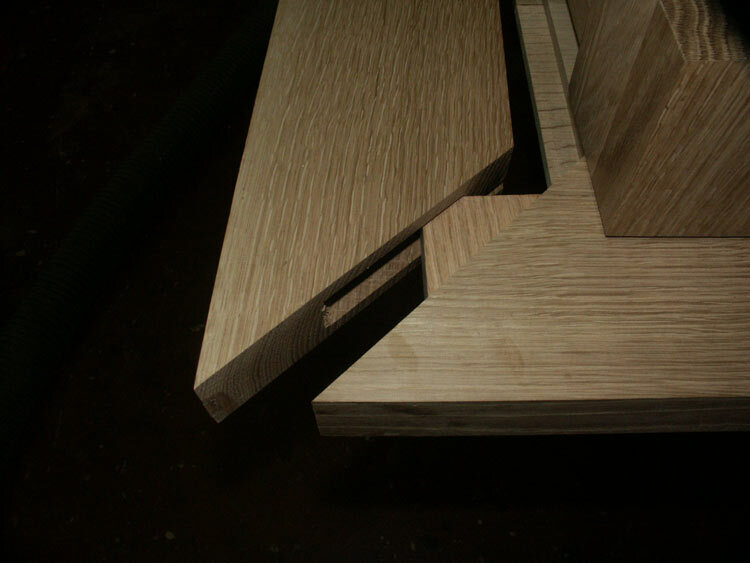 Then of course it was too perfect, so we hit it with the hand planes anyway to get the final desired look! 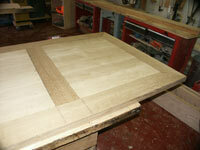 While the tabletop was out playing with the CNC machine - we had time to get working on the panels. 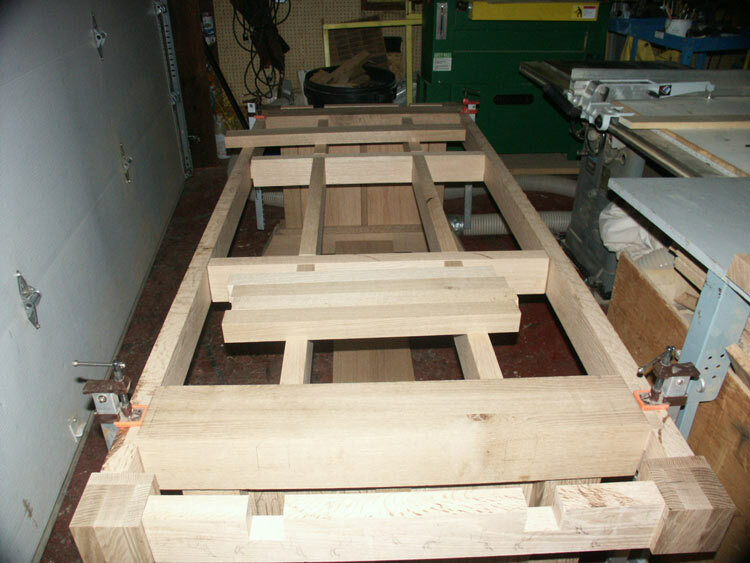 Once we had the panels, it was time to actually assemble the table. 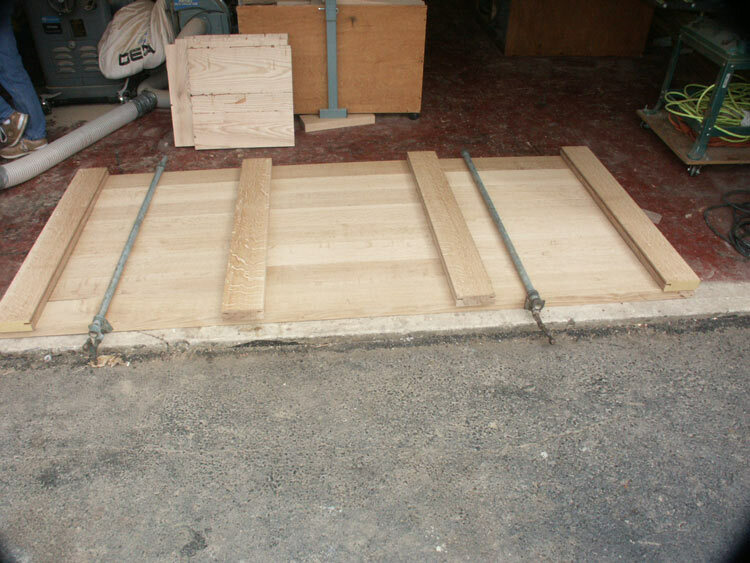 We made sure all the panels fit, and then went peg and glue happy. 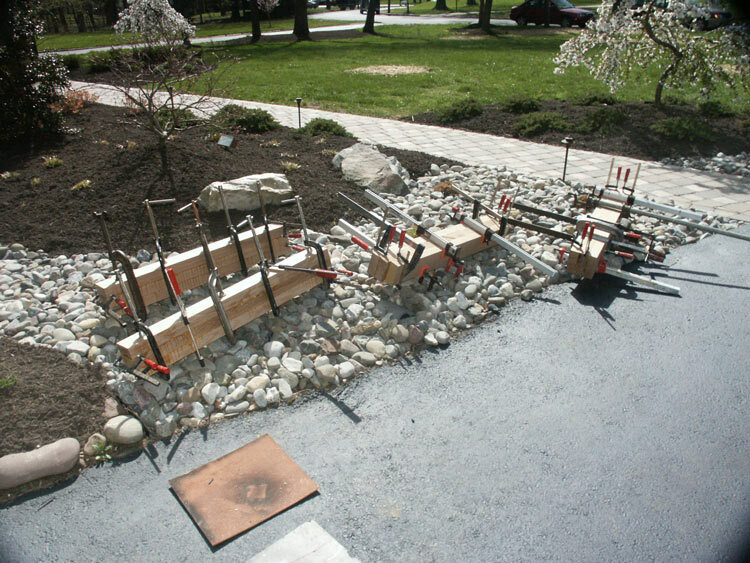 Then it was time for the leaves to support their own weight, so the baton slides were secured and the leaves were hung in place. 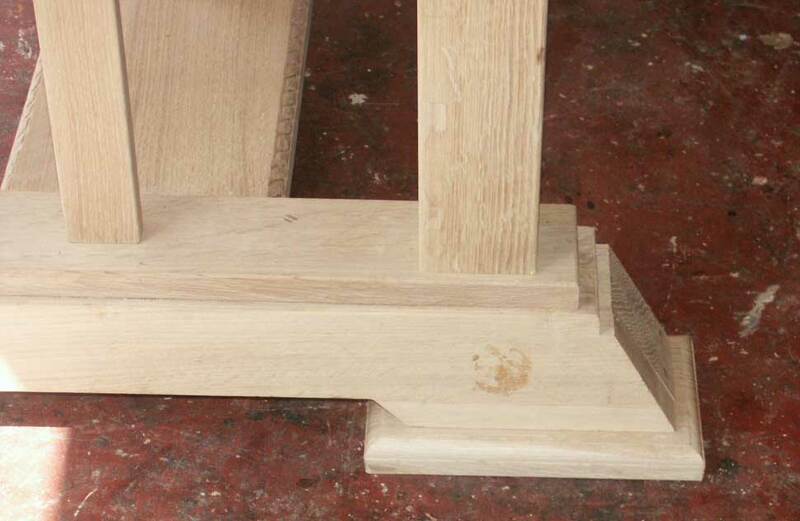 Slide bolts under the table locked them into their joints preventing accidental discharge. 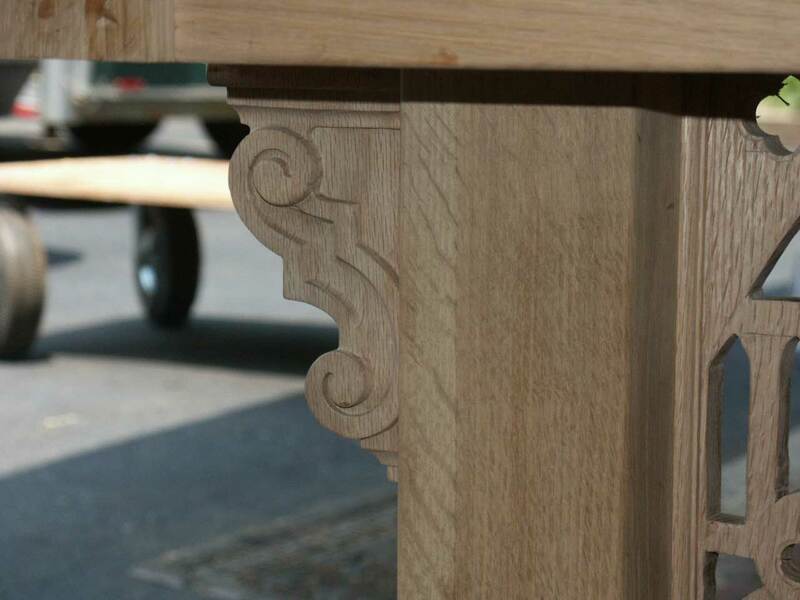 Now it was on to the detail - application of the moldings, appliqu� rosettes, corbels, and the fler-de-li's. Of course the detail becomes the tedious part. The bottom shelf was rope carved ahead like the feet bases, and the tabletop had already been rope carved at this juncture. The table then went into the sanding phase, hours and hours of sanding. 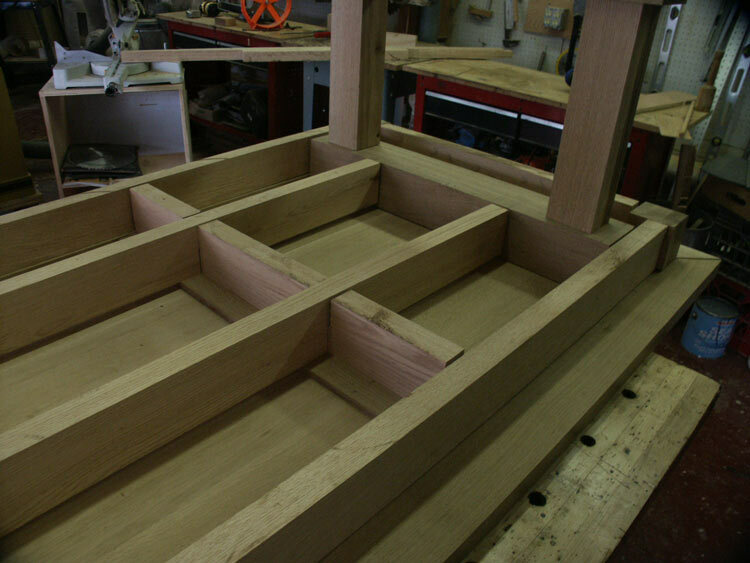 After which, we applied stain and finish. 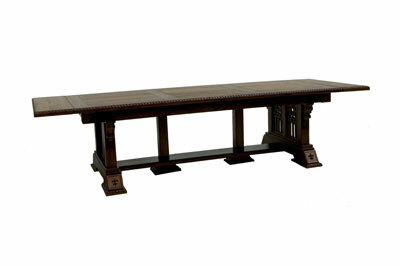 The result (shown at the top of the page) is a one-of-a-kind, original design solid oak New Wave Gothic Dining Table. 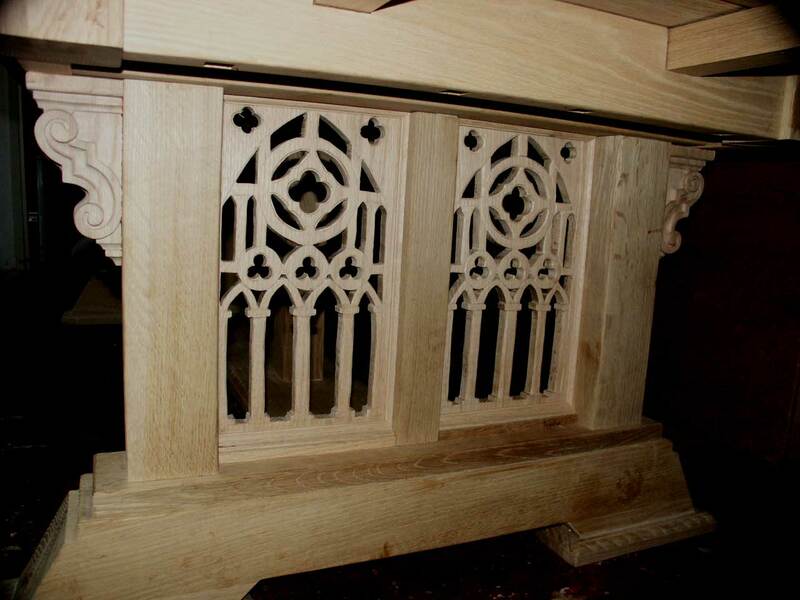 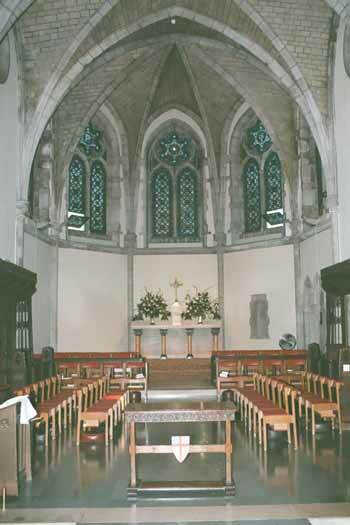 If you enjoyed this view into our projects, check out our 2002-portfolio piece; a Gothic Credence Table for Trinity Church of Princeton, NJ, an 1860's Gothic Revival Style cathedral. 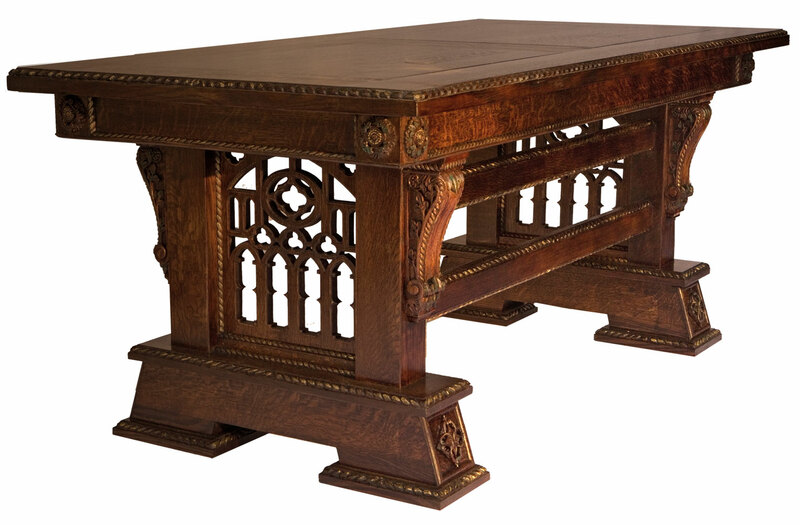 This original design by Stanley Saperstein represents a Gothic era reproduction in solid oak with a wide range of hand carving. 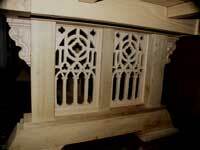 Accents include dogwood in guilloche, acanthus leaves, scrollwork, rope carving, and an Episcopal shield. 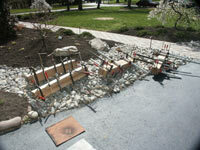 This piece serves as a memorial to Captain Edward A. States, pilot of American Airlines Flight 587 that was tragically lost in Belle Harbor, NY during November of 2001. 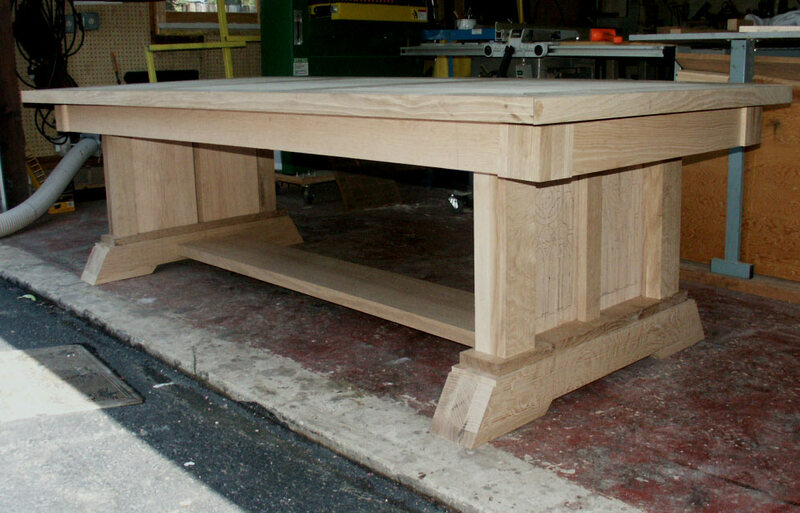 See more of our Trestle Table designs below!! 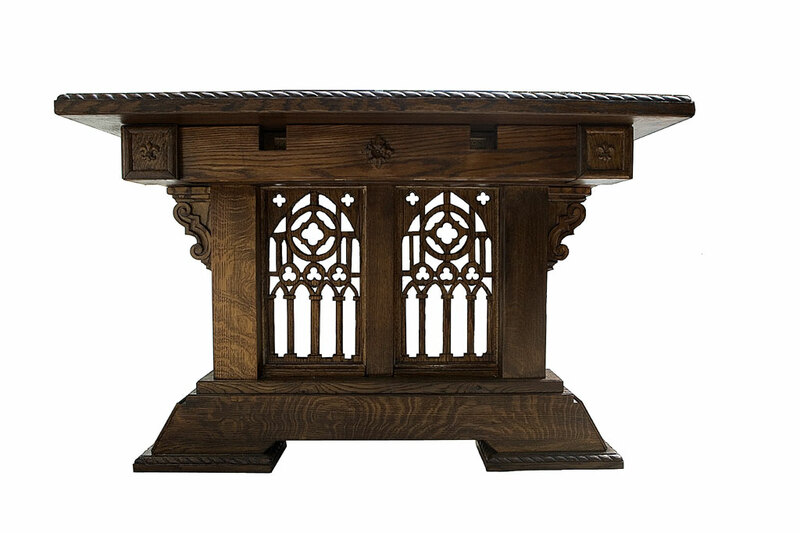 The Detailed feature of this table is in our Religious Furniture section and our special portfolio documentary and feature articles available at the links below. "Gothic credence table - an original design" by Eric M. Saperstein printed September - October 2003 Chip Chats including reprint of "Pilot's Spirit lives on in wood." 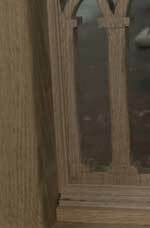 by Andrew Michael Romano, The Times, Trenton, NJ 2002. 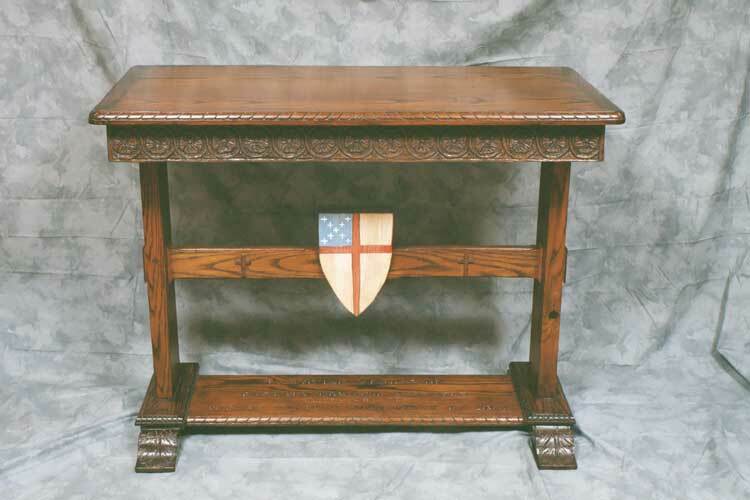 "Pilot's spirit lives on in wood" This PDF format article by Andrew Michael Romano features the dedication of the Trinity Credence Table published 11/18/03 in The Times.